A signal generator module which is capable of generating a single PWM output with a programmable frequency between 1Hz to 150KHz and a duty cycle between 1 to 100 %. Both frequency and duty cycle can be programmed via 4 push buttons which increment or decrement the frequency in 1Hz, 10Hz, 100Hz, or 1KHz steps (depending of frequency) and duty cycle in 1% increments (see specification below). Current frequency and duty cycle can be viewed on a clear 1.5" display consisting of white text against a blue backlight. 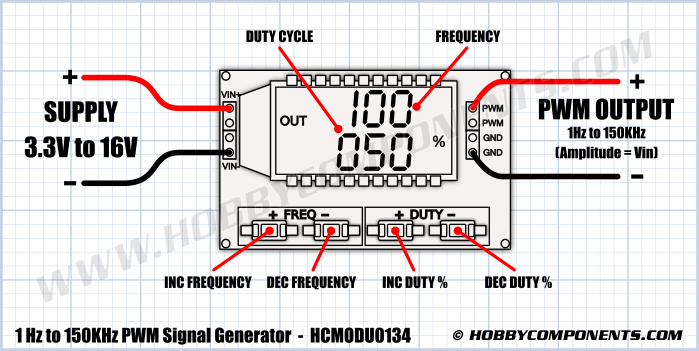 I noticed there are two PWM outputs, does this mean the module can generate two independent PWM signals? No, the two PWM output terminals are shorted together and therefore are the same signal. On the underside I see a serial interface, what is this for?